All of which is to say that—after two strong entries in “The Pilot” and “Smile“—I had carefully lowered my expectations this week. And that made Sarah Dollard’s “Thin Ice” rather a pleasant surprise. But, for all that, “Thin Ice” manages to be a fair amount of fun, and makes room for some quality character work. If it’s filler, it’s good, quality filler: Doctor Who‘s trusty “monster-of-the-week” formula done well. As I’ve said before, Steven Moffat seems determined to take Doctor Who back to the basics in Season Ten, and “Thin Ice” is an enjoyable, back-to-the-basics kind of episode. As such, I don’t have much to say this week, but let’s look at a few high-points. 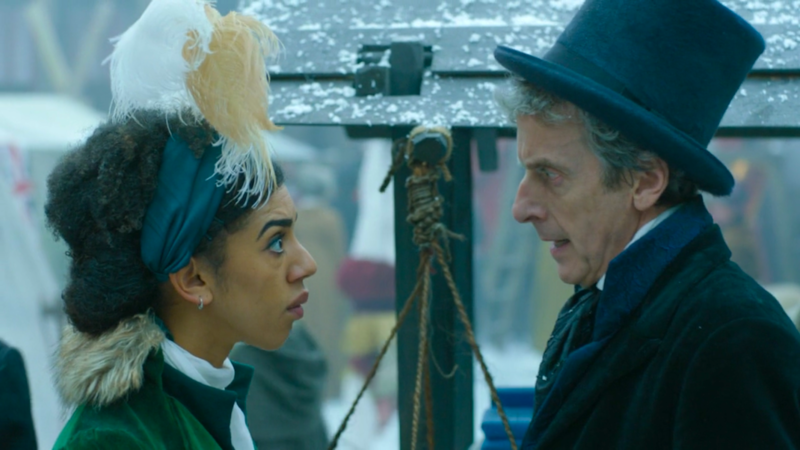 The chief charms of this episode, however, come from the interactions between the Doctor and Bill, as Pearl Mackie continues to be exactly the breath of fresh air that Doctor Who needed. The Doctor/Companion chemistry is always delicate, and some combinations just generate more power than others. Sarah Jane Smith (Elisabeth Sladen) was a perfectly decent companion to Jon Pertwee’s Third Doctor, but the magic didn’t happen until she was paired with Tom Baker’s Fourth Doctor. Sylvester McCoy’s first season with Mel (Bonnie Langford) is a little better than its reputation, but the Seventh Doctor only truly came into focus once he was joined by Sophie Aldred’s Ace. And what we think of as the deep connection between Rose (Billie Piper) and the Doctor didn’t really happen—for better or worse—until David Tennant’s Tenth Doctor arrived on the scene. Though I wouldn’t want to disparage the delightful Jenna Coleman—who bore none of the blame for her sometimes frustrating character—”control-freak” Clara was a better companion to Matt Smith’s childlike Eleventh Doctor than she was to Capaldi’s older, more serious Twelfth. Now Bill—as strong as Clara, but more down-to-earth, and less smugly self-confident—seems to be bringing out the best in Capaldi’s Doctor. I don’t just like her, I like him better—finally—for being with her. So this is a common theme for the Twelfth Doctor’s era. But, as with everything else so far this season, Moffat and Co. are managing to hit it in a lighter way than they have previously, without a lot of overly emotional sturm und drang. Bill realizes that he does care, late in the episode, after his speech to Lord Sutcliffe about the value of the “umimportant life.” But Bill doesn’t even need the big speech: my favorite moment in this episode—and the one that makes me unconditionally love Bill—comes just a few minutes after her fight with the Doctor. Are they still fighting? Kitty (Asiatu Koroma) asks Bill. “No,” Bill says. “I’ve moved on.” The Doctor hears her echo his own words, and Bill—seeing him notice—just sticks her tongue out at him. It’s a wonderfully light and effortless reconciliation scene, better than any amount of maudlin dialogue or dramatic speechifying. By the end of the episode—without Dollard needing to underline it in the text—Bill has quietly gotten on board with the Doctor’s practicality. 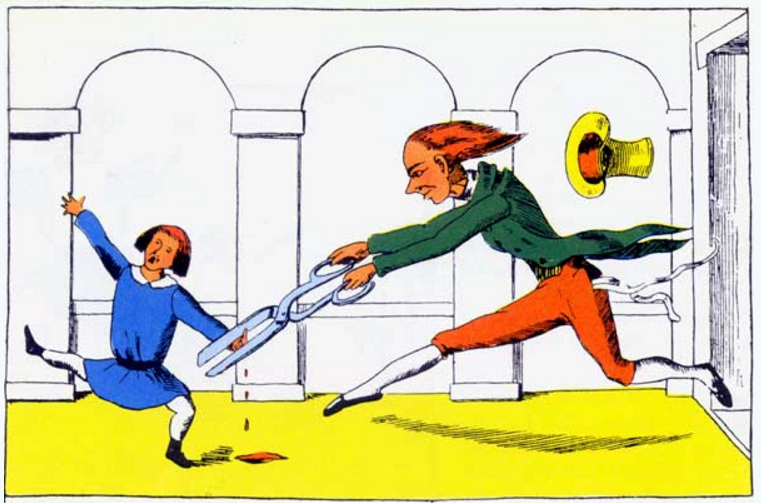 She winces when his escape plan involves suckering one of Sutcliffe’s guards into the ice, but she doesn’t protest: sometimes, the options really are limited. And when the ice is about to explode—with a lot of Londoners still on it—she simply grabs the few people she can save and runs for shore. “Forget them, there’s no time,” she says of the others: faced with the realities of this life, she’s already becoming someone who can make the hard decisions, without a lot of fuss. You save who you can, and you move on. Bill, however, just seems to be independently fabulous. She was thirsting for knowledge and investigating mysteries even before she fell in with the Doctor, and she brings her own individual spirit and essential decency to the role of companion now. 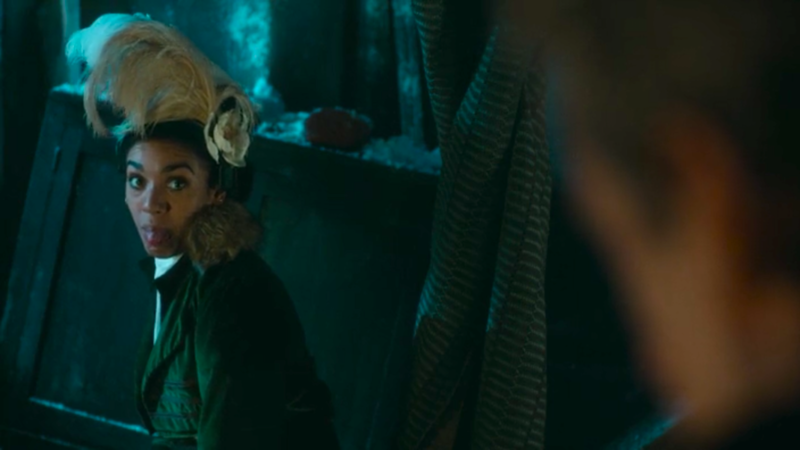 On paper, hers may be the most explicitly “student/teacher” relationship with the Doctor since Ace’s, but—while she has things to learn from him—we do not have the sense that this season will be about his having to change her. She doesn’t need changing. Like quintessential classic-series companion Sarah Jane Smith—and the most formidable of the modern companions, Donna Noble—Bill came ready to play. Doctor Who‘s formula is a delicate one: the show has always been a balancing act between being about the story of the week, on one hand, and being about the Doctor/Companion relationship, on the other. The classic series came down more on the former side: we had to like the Doctor and his TARDIS-mates—they were our surrogates, our anchors, our entries into the story—but we didn’t spend a lot of time gazing into their souls. The new series has, at times, gone too far in the other direction: what mattered often seemed to be how events shaped the characters, instead of the other way around. It’s early days yet—there’s still plenty of time for it to go wrong—but Season Ten seems to be hitting just the right balance. One very welcome element of this episode that I didn’t mention was the awareness of racism. One could wish for a slightly more sophisticated treatment—loathsome villain Lord Sutcliffe provides the only, cartoonish example—but the effort is appreciated. 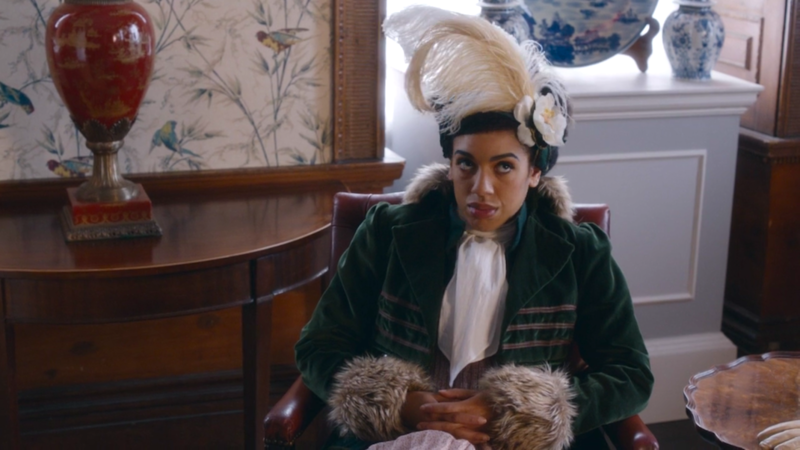 This is something Russell T Davies just barely feinted towards when Martha (Freema Agyeman) was traveling in the TARDIS, and it’s nice to hear Doctor Who acknowledge racism and historical whitewashing. I hope Sarah Dollard is not the only one of Bill’s writers to pick up this thread. Bill wasn’t horrified by the bodies in “Smile,” because they were already dead. “Morally and practically, that is not a useful distinction,” the Doctor says. “Unlearn it.” After all, to a time traveler, everyone is already dead. Watching this episode—particularly the underwater scenes—made me miss Doctor Who Confidential, which ended after Season Seven. I understand why they axed it—among other things, it was no doubt one obligation too many for the busy cast and crew—but there was value, I think, in seeing how the sausage was made. A scary one next week? I love the scary ones. And David Suchet’s presence can only bode well.